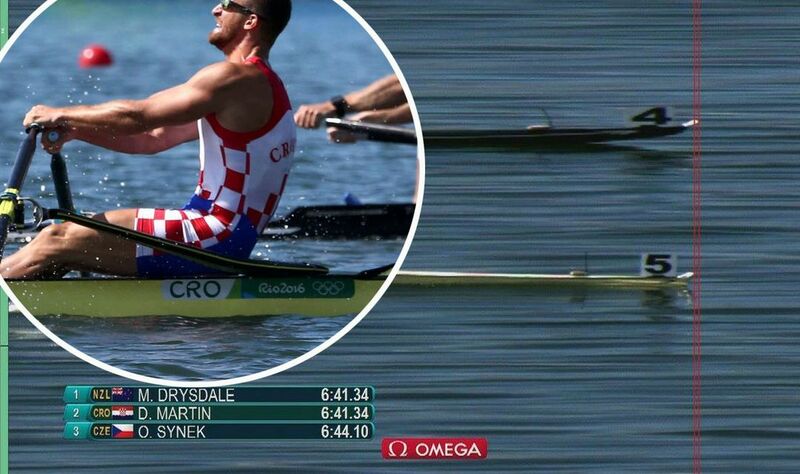 I don’t know if there should be a winner if the difference in a race is less than a second. Can you really say you won if the clock can’t even measure it? It’s like bobsledding. I don’t even know if it’s fair to classify it as a sport any more. The difference between first and last is something like under a second. Eight teams separated by less time than it takes to breathe. Even the eighth place guy has to be like, “If I just didn’t eat that donut we could have won.” But I don’t think people would be okay with giving away so many gold medals. They want it to MEAN something. Even more than the athletes, I think common, everyday folks like us would rebel. Instead, we will demand more accurate clocks. Because it’s really important to us to know that we’ve won. We like coming out on top. We like knowing that we are the best, even if being the best is more a matter of random chance than real skill. This tendency to compare ourselves to others even bleeds into our Christian faith and expresses itself in what would seem to be a completely harmless expression: “Love the sinner, hate the sin.” Love the sinner, hate the sin. On the surface it sounds very Christian. Loving even. I mean, isn’t that what we are supposed to do? Aren’t we supposed to love the sinner and hate the sin? If we take those things separately the answer would be “yes.” We should love sinners and we should hate sin. But my mom used to have a saying, “It’s not what you say, but how you say it.” Normally, she was talking about the sarcastic way I would “agree” to take out the trash. But in this case I think she would say, “It’s not what you say, but the context in which you say it.” It’s not what you say, but the context in which you say it. This morning we are going to read from a story about Jesus that Luke shared with us. If you have a Bible or Bible app on your phone please turn to Luke 18 beginning with verse 9. Like I said, individually each of those sayings is correct. We should love sinners and we should hate sin. But when people use this expression rarely are they simply mashing together two independent thoughts into one sentence. Usually, it’s in reference to someone or a group of people that we have labeled “sinners.” It’s that idea we will see play out in this parable that Jesus shared. At least I’m not like him. Have you ever caught yourself thinking something like that? 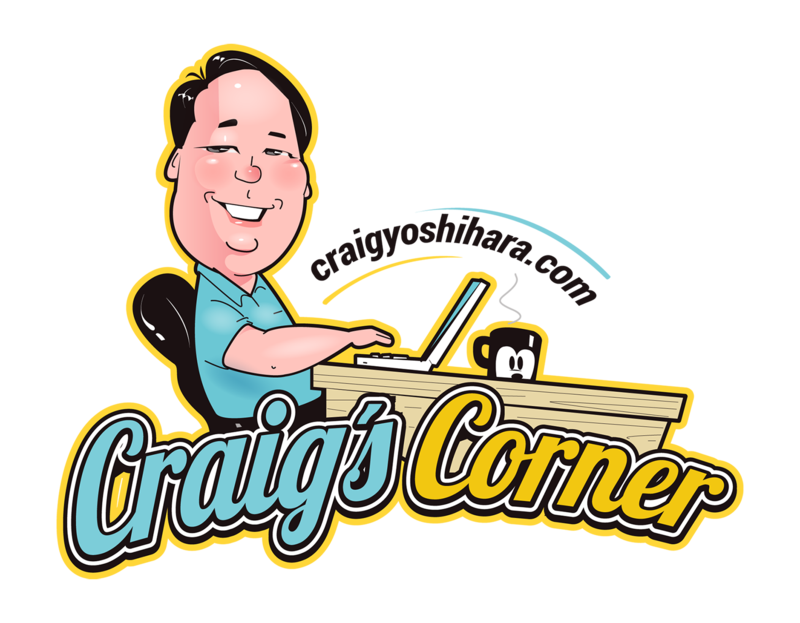 You hear about someone in the news who was caught stealing, or cheating, or hurting someone and there’s a part of you, a part you probably don’t even say out loud that whispers, “Well, at least I’m not like him.” And that’s what is going on in this story. These two guys are going up to the temple to pray and the Pharisee makes sure to keep his distance. He doesn’t want to be seen with a TAX COLLECTOR (insert your preferred most hated profession here). 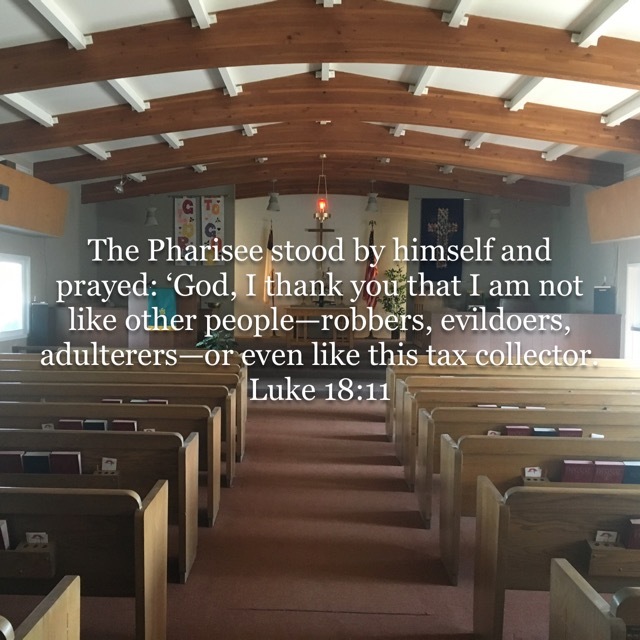 So the Pharisee stands apart from him and prays this prayer: “God, I thank you that I am not like other people—robbers, evildoers, adulterers—or even like this tax collector. 12 I fast twice a week and give a tenth of all I get.” Amen. The Pharisee doesn’t admit to any wrongdoing. He doesn’t confess to any sins. He simply says, “at least I’m better than THIS guy.” Meanwhile, the tax collector, who probably feels unworthy to even be in the temple, simply asks for forgiveness, and Jesus said that it was the tax collector God was pleased with. Sure, the Pharisee followed the rules. He fasted. He gave his tithe. But he did it as much for himself as for God. The tax collector had humility in his heart and that’s who God was pleased with. Pride is what gets between us and God. That’s what was wrong with the Pharisee. His pride. “At least I’m not as bad as THAT guy.” It’s that arrogance, that judgmental attitude, to dare to elevate yourself above others that did him in. When we compare ourselves to others like that, it’s an attempt on our part to mitigate our sin, to say that even though I know I’m not perfect, there are other people much worse than I am out there God so you should be happy with me. But God doesn’t care about that. God cares about YOU. That’s why in Romans it says, “for all have sinned and fall short of the glory of God.” Because it doesn’t matter if you’re a little better or a lot better than the next guy. God’s concern is with YOU. God is concerned about YOUR heart. As Jesus said earlier, we need to take the plank out of our own eye before worrying about the speck in our brother’s eye (Matthew 7:3-5). So when we say, “Love the sinner, hate the sin,” we presume that the OTHER person is the sinner. It’s the OTHER person who needs some help. Not us. In his book Half Truth, Adam Hamilton says, “When ‘Love the sinner’ is our mantra, we’ve put ourselves in a position of seeing others as sinners rather than neighbors…I think what turns people off is when religious people point out the sins of others but act as though they have no sins of their own.” We might admit to having sins, but there is this air about us when we start acting judgmental of others that somehow our sins are not as bad as someone else’s. There’s a dangerous thought among Christians and even non-Christians. It’s this idea I call the checking account view of Heaven. The checking account view of Heaven. It’s the thought that if I do enough good deeds, I’ll make it. I don’t really have to believe. I don’t really have to read the Bible. I don’t really have to go to church. I just have to prove that I’m good enough and I’ll get into Heaven. God can’t fault me for not believing or not going to church or not reading my Bible if I do enough good deeds. Somehow we came up with this idea that God is keeping score. And I think a pretty low score at that. We’re not even trying for an “A.” We’re just trying to stay in the plus column. And because our deeds don’t have a numerical value (we don’t get a point for washing the dishes and two points for washing the car) the only way we can kind of mentally figure out where we stand is by comparing ourselves to other people. And that’s what is dangerous. As soon as we do that, as soon as we start comparing ourselves to one another, we lower the bar. We keep playing for the minimum amount of effort. We sleep soundly at night not because we’ve done a stellar job of loving our neighbor but because we turn on the news and at least half of those people are way worse than us. But that isn’t how God expects us to behave and we dishonor God by comparing ourselves to each other. The biggest mistake we make is assuming life is a zero sum game. God’s intention, his desire, is for everyone to come to him. In 2 Peter 3:9, Peter tells us, “The Lord is not slow in keeping his promise, as some understand slowness. Instead he is patient with you, not wanting anyone to perish, but everyone to come to repentance.” You don’t need to compare yourself to others because God doesn’t care if you win the gold or get the silver. He cares and loves everyone the same whether they come in first place or last. What he DOES care about that no medal or prize or award can ever give is the goodness in your heart. What God cares about is the goodness in your heart. That isn’t something you can measure against other people. It’s something that is between you and God. Hamilton tells a great story about how we SHOULD act toward one another. He wrote, “Some time ago I read an interview with Billy Graham’s eldest daughter, Gigi. She was her father’s date to Time magazine’s seventy-fifth anniversary party, a banquet in Washington, DC. President Bill Clinton spoke at the event. He had just been impeached by the House of Representatives for perjury and obstruction of justice. The charge of perjury involved what President Clinton had said, under oath, about his relationship with White House intern Monica Lewinsky. 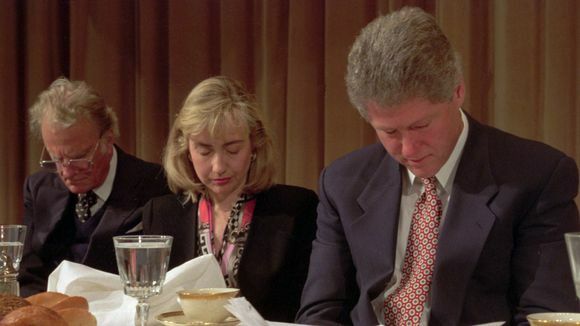 At the banquet, her father sat with President and Mrs. Clinton. He was warm and gracious to them. After the dinner ended and Graham and Gigi were riding back to their hotel, the two discussed difficulties the president and First Lady were going through with so many people gossiping and judging. Gigi said her father’s simple comment was, ‘It’s the Holy Spirit’s job to convict; it’s God’s job to judge; and it’s our job to love.’” It’s the Holy Spirit’s job to convict; it’s God’s job to judge; and it’s our job to love. So let’s do that. Let’s focus not on what others do wrong, but instead focus on how we can love them; how we can show them the kind of love that God offers to us despite our own sins. Because in the end, love is what it’s all about. As it says in Matthew 22: “‘Love the Lord your God with all your heart and with all your soul and with all your mind.’[a] 38 This is the first and greatest commandment. 39 And the second is like it: ‘Love your neighbor as yourself.’” In the name of the Father and of the Son and of the Holy Spirit. Amen. Adam Hamilton, Half Truths, p. 153.